Many people instantly fall in love when they first lay eyes on a French Bulldog. Who can resist that comedic, inquisitive, and tightly-wrinkled face topped with those pointy, bat-like ears? This adorable breed comes with a price though – a rather large one. A purebred French bulldog purchased from a responsible breeder can cost between USD$1,400 and USD$8,500! Show-quality dogs and dogs in the rarer colors such as blue can cost even more. So, why the whopping price for Frenchies? Other associated costs including small litter sizes and ongoing health issues. Let’s look at each of these in more depth. Natural mating is usually not an option for Frenchies. Both males and females possess anatomy features which make normal reproduction very difficult – even dangerous. French Bulldog males have a hard time reaching the critical part of the female, which is positioned rather high on the body. They can easily become overheated or injured while trying. Their narrow hips make it difficult to successfully breed as well. The females don’t have much in the way of hips or “handles” for the males to grip when attempting to mate. Those slender hips also make natural birth nearly impossible. The large heads and broad shoulders of the puppies would get stuck, resulting in the loss of the litter and injury or death of the mother. In order to produce these wildly popular puppies, breeders must intervene with a series of costly procedures. Progesterone tests are required to determine when exactly the female is ovulating. Blood tests are also needed to ensure that the future mother is healthy and strong enough to carry a litter. When the time is right, the female is then artificially inseminated. The cost can vary based on the sire’s pedigree, but it is not cheap. Pregnancy tests are next, followed by prenatal care, which includes check-ups, supplements, and possibly a special diet. The costs quickly add up. Because of those slender hips, a c-section is almost always necessary. They are, of course, not free, and the bill can skyrocket if a trip to an emergency vet for an unscheduled c-section occurs. Breeding can cost as much as $7,000 per litter. And often, the litters are quite small. Most litters average 3-5 puppies each. The costs continue to rise after the pups are delivered safely. A trip back to the vet occurs a few days after birth to ensure that the mother is recovering normally and that the pups are healthy and free of defects. Around eight weeks of age, it’s back to the vet for puppy shots. Often a new mother’s instincts do not kick in right away and the breeder must provide the litter with constant care. Jobs like bottle feeding, stimulating the puppies to relieve themselves, and making sure that the mother does not accidentally smother the pups all take time and effort. Before purchasing one for yourself, know that the breed is prone to some health issues which can lead to pricey vet bills. Respiratory, back, and hip problems are fairly common but can be managed with quality vet care. Understanding why French Bulldogs are expensive should give you a new appreciation for the breeders and all of the time, effort, and money that goes into producing these puppies. Yes, they can be expensive, but the joy of owning one of these dogs is absolutely priceless! My puppy of 5 1/2 months gets very itching with clothes and harness on. She cannot walk at all always itching against wall? Thanks for reaching out. 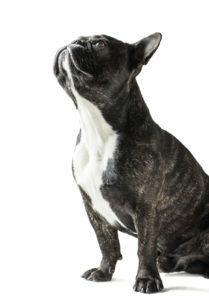 Some French Bulldogs can develop skin sensitivities to certain materials, and they are also very susceptible to allergies from food or the environment. This may be the cause, but I would suggest seeing a vet to get a proper examination. Join the #1 community for French Bulldog owners and lovers!